To place an order for items other than canoes or restorations, bookcases, or custom orders please download, print, and fill out our order form. You'll need the free Adobe Reader to download the form. Then fill out the form and mail it to us. To order a canoe or bookcase, or to discuss a restoration or custom order please call or email us. 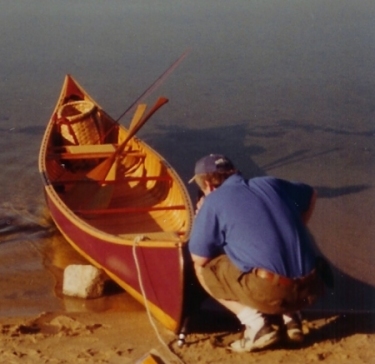 Shipping And Pick-Up: Canoes, bookcases, and canoe poles are shipped ground freight at cost. Crating is extra. Wannigans, toboggans, and ice hooks generally require extra shipping and will be shipped at cost. All items are shipped UPS or USPS (delivery confirmation requested). Tracking information can be provided on request. Picking up your item at our shop is available by appointment only. We ship by United States Postal Service We ship by UPS only by request. Canadian Shipping: USPS can take two weeks or longer to deliver your package. UPS delivers your package in about five days HOWEVER: UPS is going to surcharge YOU on your end. Averages about $25.00 per package. This pays for their walk through broker fees. If you are ordering with a check, please include 20% shipping. If the 20% doesn't cover the shipping cost we will bill you for the balance. If you are ordering with a credit card, please expect to be charged for the actual shipping cost. If you need a copy of the shipping invoice, please request it with your order. Return Policy: If you receive any product from Pole and Paddle canoe and are unhappy with it for any reason, return it in unused condition and we will refund the purchase price and shipping both ways. If you have questions about any of our products give us a call or send an email.